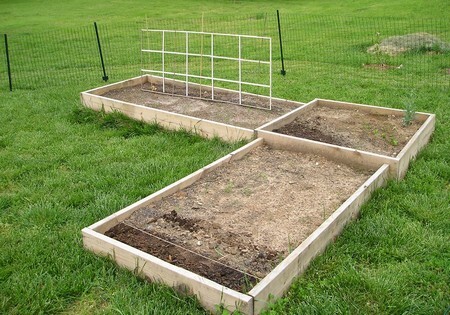 Here is a potentially difficult situation where an L-shaped plot could end up as two separate gardens. The layout is designed to unite the two main areas and to focus the eye on the corner furthest from the house in order to try to make the garden look bigger than it really is. To do this, I have angled the paving along with everything else so that it would be almost impossible, when looking out onto the main garden, to look anywhere other than in the direction of the furthest corner. The garden seat acts as a useful focal point as well as providing a pleasant alternative view of the garden. With such an angular patio it would be easy to use square or rectangular slabs because, apart from two 45° angles near the circular water feature and where slabs come up against the walls of the house, everything is at right angles. A layout of slabs would be enhanced by a brick edging 105 mm wide, especially if there was visible brickwork on the house. It has been assumed that the patio would end up flush with the lawn but if, under different circumstances, it had to be raised, a generous mowing strip or extra slabs fitted flush into the lawn would be needed to make the mowing of all those internal corners possible. The seat would enjoy some shade while the patio was basking in sunshire. This shade could be accentuated by the addi­tion of a moderate-sized tree in that corner. The shape of the lawn, though formal, does have a hint of informality, with curves coming off the patio and a path entering on the left from the fruit and vegetable garden. This area could be screened from the main garden by a rustic trellis, about 2 m high, made up of horizontal, vertical and perhaps angled poles. This could then support climbing/ rambling roses with clematis. The border in front of this trellis is the ideal place for a traditional or mixed herbaceous border. The side garden is connected to the main lawn by a wide grass path and a rustic arch. Within the side garden there is an arrangement of fruit and vegetables with slab paths (more practical than grass) around three sides. There is also a greenhouse and there would be room for a compost area should the bins behind the shed prove insuffi­cient. Both fences would receive a reason­able amount of sunshine and could, therefore, be used to grow cordon or espalier fruit trees and perhaps loganber­ries or cultivated blackberries. In very mild districts, the south-west facing fence would be quite suitable for a hardy grape vine. If that fence were to be replaced with a wall, a lean-to greenhouse could be sited here, alongside a vine, peach or nectarine (fan trained). The water feature I have shown is a millstone with a central bubble of water. The water would flow over the edges and down into pebbles or cobbles. Beneath all this is a large reservoir of water and an electric, submersible pump. Not all the space in that area would be taken up by the water feature — some planting space would be available around the edges. Here, a selection of short grasses and dwarf bamboo would look especially effective. The path which links the patio with the shed is far enough away from the fence for something worthwhile to be grown, perhaps more espalier or cordon fruit trees. The back of the house receives a good deal of sunshine, making it possible to grow a few of the more exotic climbers, and the patio has plenty of corners where pots or tubs of annuals and bulbs would add splashes of seasonal colour.